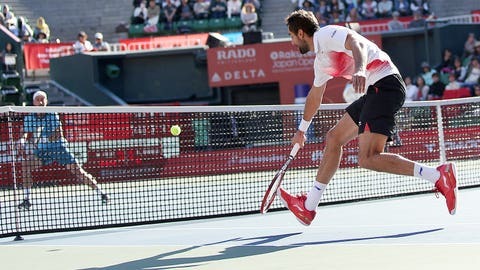 Croatia's Marin Cilic (right) returns a shot against American Steve Johnson during their second round Japan Open match. Marin Cilic overpowered Steve Johnson 6-3, 6-3 on Thursday to advance to the quarterfinals of the Japan Open. The sixth-seeded Croat saved all five break points he faced to set up a quarterfinal with second-seeded Kei Nishikori, who is bidding for his third Japan Open title. Cilic, who is seeking his first title of the year and the 14th of his career, hit a powerful forehand to wrap up the match in 73 minutes. Cilic beat Nishikori in the final of the 2014 U.S. Open but the Japanese player won their last meeting in the semifinals of the Citi Open in August and owns a 6-3 record against the Croatian. In other matches, qualifier Austin Krajicek beat Joao Sousa 2-6, 6-4, 6-3 and will next face top-seeded Stan Wawrinka. Nick Kyrgios lost just eight points on his serve to sweep into the last eight with a 6-4, 6-2 win over Roberto Bautista Agut. Kyrgios will face France’s Benoit Paire in the next round. Paire beat Marcos Baghdatis 6-3, 2-6, 7-5. Both Nishikori and Wawrinka had the day off after booking their places in the quarterfinals on Wednesday.